Sony shows-off gesture-controlled Xperia Projector concept | What Hi-Fi? The future of projectors? 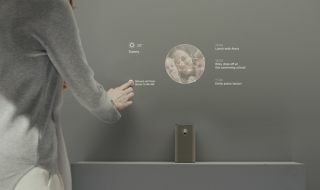 Sony announced a range of “smart products” at MWC, including the Xperia Projector, which can beam an interactive image on to any surface and be voice and gesture controlled. It's not all smartphones and tablets at MWC 2016, Sony found time to reveal a suite of products concepts to accompany its range of Xperia mobile products. The most eye-catching in our book was the Xperia Projector, which allows you to beam images to a clear screen, and then control what you're seeing by touch, voice and gestures, just like in Minority Report (kinda). Bringing the smartphone user interface experience to a big-screen, and from a compact projector, the device was being demonstrated as a concept at the show - as you can see in our video below. Other products in the range of "smart product concepts" include the Xperia Ear. This is a wireless earpiece that can feed you information such as your daily schedule, weather and the latest news. It can be voice-activated, so you can make calls, search the web, dictate text messages or navigate using voice instructions. You’ll need an Android phone with Bluetooth or NFC to use the Xperia Ear and a compatible app will allow you to adjust various settings. It’s available from summer 2016. There was also the Xperia Agent, "a vision for a personalised assistant", which can respond to a number of commands. It has a built-in camera and a projector display for beaming information in to view. The Xperia Eye is a compact, wearable wide-angle lens camera that can be attached to clothing or worn around your neck. It too uses Sony's voice technology, taking a picture at your command and featuring a 360-degree spherical lens. Finally, the RM-X7BT in-car Bluetooth dongle allows you to stream music in your car using Sony’s voice technology. It will be available from summer 2016.